Round 4 will be on Nev's track this Wednesday night. Last edited by Sports Racer; 11-18-2018, 11:31 PM. look awesome... you are not running only slot car on this isn't it? 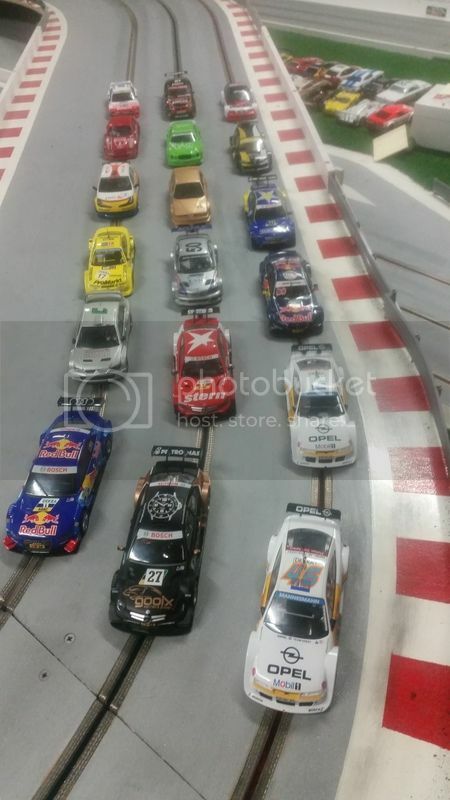 The finishing order from last nights race, some changes in the order due to some cars just not liking the track. I couldn't make it to the race last night so Andrew (32coupe) ran it. I spoke to him this morning and he said some cars like Gas's and Alexis just didn't like the surface and were struggling for grip. Others like mine and Bov's came good. The 3rd car there isn't an official entry so congratulations to Bov for his 3rd place, Radarek for 2nd and the giant killing Calibra of Leadfoot's for the win. Well done. Sorry no videos this time. Last edited by Sports Racer; 11-21-2018, 04:20 PM. Nice! Congratulations to Leo for his win.....well done! First ever win in a proxy I think?? You beat what's his name......Radar......Riddick.....can't remember now??! !